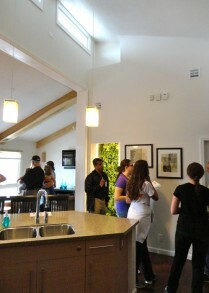 Purdue University designed and built a house, complete with clerestory windows, garage and a self-watering biowall. 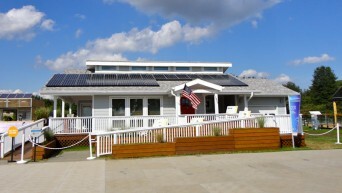 The University of Purdue created a Solar Decathlon house that would blend in with American suburbia. 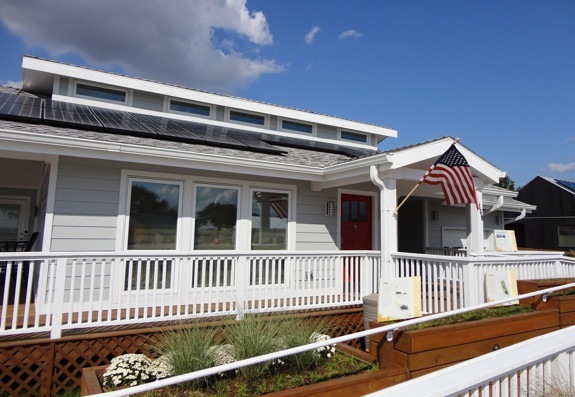 Called the INHome, paying homage to their home state of Indiana, the home is powered by 36, 240-watt solar panels for a 9.0 kW system that can annually produce as much energy as the house consumes. 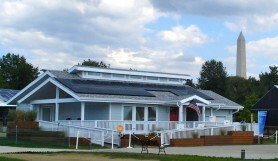 The INHome achieved net-zero energy balance during the 2011 Solar Decathlon, and received 2nd place overall in the competition. The beauty of the Solar Decathlon is the creativity and diverse range of homes that different universities build. The INHome has traditional looks that could blend into any American suburbia. But don’t let its conventional looks lull you into thinking that it won’t perform. The team from Purdue University has consistently placed in the ‘top 3’ in this year’s Solar Decathlon categories. It also received 2nd place and almost full point designation in the ‘Affordabilty’ category after being estimated to cost $258,000 to build. Built from traditional 4″ SIPs (structurally insulated panels) the home has been performing well in the ‘Comfort Zone’ category. SIPS typically are made with plywood and wooden 2 x 4 studs, with a polystyrene insulation in the middle. This type of insulation often does not have thermal breaks, is light, yet structurally very strong. 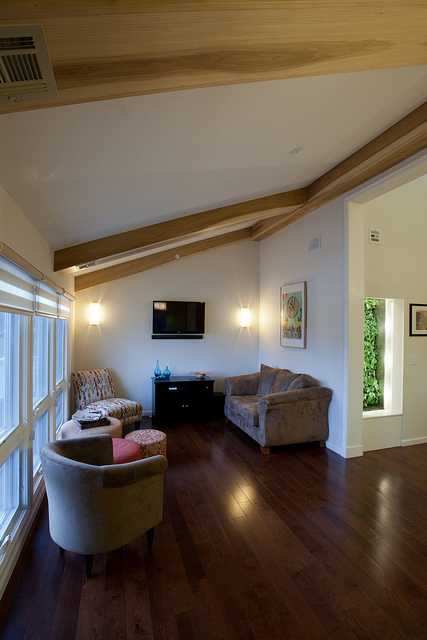 The INHome utilizes vaulted ceilings that allow light into the home and give it a nice lofty feel. The view from the kitchen, the self-watering biowall help to filter the home’s air. 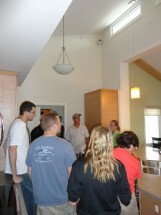 See the windows near the top of the vaulted ceiling – they are the clerestory windows. Remember in elementary school when your teacher taught you that that hot air rises? When the windows in the front room are opened in combination with the clerestory windows, it allows the house to be passively cooled. Air is pulled in through the ground floor front windows, then will push the warmer air out of the house as it rises and exits the home through the windows located at the top of the house. This is a passive means of cooling a home because it works by its design – without any auxiliary motors or electricity. Another innovative aspect of this house is that the conditioned air is filtered through a biowall. Recall another elementary science lesson learned – that plants take in carbon dioxide and give out oxygen. Did you know that they also filter out benzine, formaldehyde, and other common carcinogens found in many homes? The biowall is also self-watering. Utilizing a similar action to a pump that is used in toilet tanks, water will fill the tank up to a certain point, then stops. Air is filtered again in the HVAC, then circulated through the house. The INhome can be remotely controlled by a smartphone or iPad. This is also the only Solar Decathlon home that has a garage. Seventy percent of the INHome’s windows face the south. The abundance of the windows on the south may cause overheating, as it does not appear that materials with thermal mass were used. Nevertheless, the incoming sunlight and the light color of the walls give it an open, airy feel. The clerestory windows and the ventilation they allow also help to keep the house cool. The INHome is the only Solar Decathlon home with a garage, a fairly standard feature on most American homes. 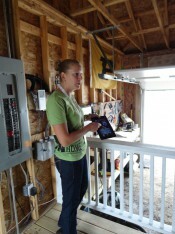 The garage houses some of the mechanical systems, many of which can be controlled remotely with a smart phone or iPad. Another innovation that the team from Indiana is using is a heat-pump hot water heater that utilizes the heat from the ambient air inside the house to make hot water. 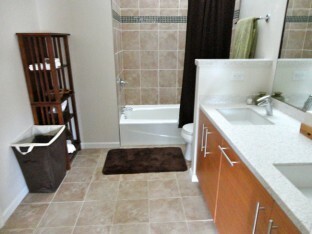 To see more of the InHome, view the gallery and video below. Click on a picture below to enter a slideshow of the photo gallery. Use the arrows to navigate or click on the right hand side of the photo to progress to the next one. The plants are integrated into the HVAC of the Solar Decathlon home. 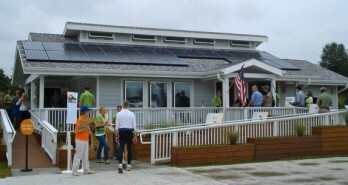 The team from Indiana did exceptionally well with their first entry in the Solar Decathlon. 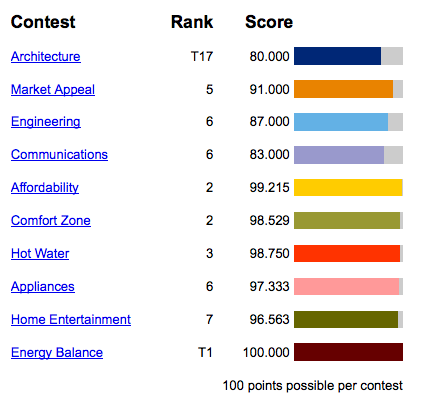 The final scores for Purdue’s effort in the 2011 Solar Decathlon. 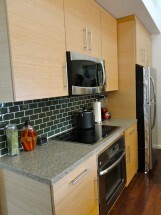 Could this be a new standard for the New American home? It was one of the more affordable homes, achieved net-zero status, and had a podium finish with the silver medal with 2nd place overall for the 2011 Solar Decathlon. See the original model that the Indiana team submitted.